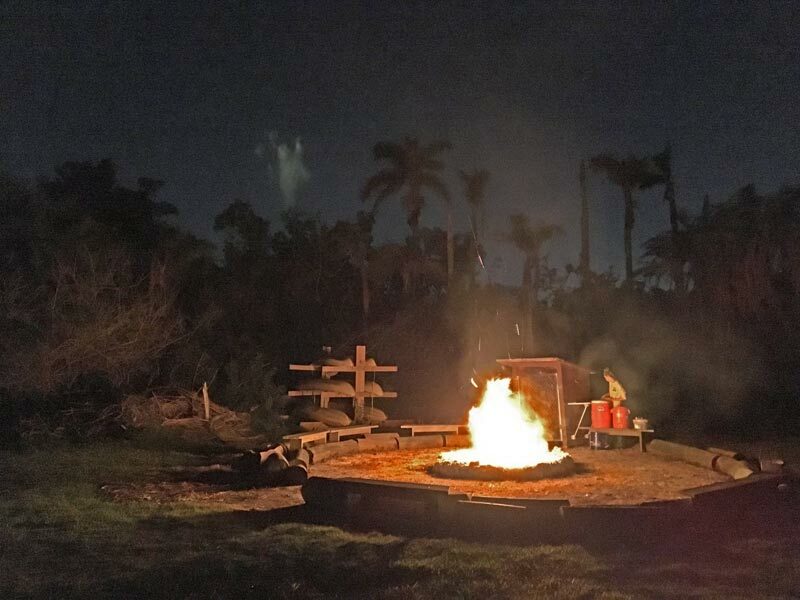 If you're looking to relax and reconnect with nature, Deering Estate's Nite Hike & Campfire is a surprisingly good way to unwind. On scheduled nights, they'll open up the locked gates to allow in a select few lucky adventurers. Just before dusk, the group heads down to the water to look for peaceful manatee and schools of fish that tend to use the lagoon as their playground. Then, as the sun creates wonderful hues as it sets, it’s off to the more natural areas of Deering Estate's 444-acres. On the night I attended, Jared was our expert guide, with Christine in tow. Humble and knowledgeable, Jared explained everything we saw and pointed out the things most people would easily miss. As we unlocked the gate that allowed us access to some of the usually hidden acres at Deering Estate the moths start appearing, including the huge Pharaoh moth. We learn about the Gumbo Limbo trees that can survive without leaves since it's bark can photosynthesize. It is also a natural antiseptic. Jared walks us down a path to look at spider-webs and marvel at the nature Charles Deering left. He reveals that the path was actually the old railroad path with a few stakes still poking out of the ground. The evening discovery included facts about the canal system and native and invasive plant species. "The cycle of life is always evolving," explained Jared. "Hurricane Irma did significant damage to our canopy, so now ground cover plants are flourishing. This will reverse as our trees regain their leaves and the ground once again becomes heavily shaded." Man-made structures were not so evolved. The raised “boardwalk path” was completely destroyed that used to take visitors over the swampy areas of Deering Estate. We are entranced with new nature knowledge and make our turn back at Cutler Creek. We listened for great horned owls and eastern screech-owls along the way, but it wasn’t until we were beside a crackling campfire enjoying complementary s’mores that Jared literally called the owls to us. Defending their territory, they dove from all directions to give us a glimpse of their beauty. April 11 and May 9 are the next two dates for this fun event (runs 7:00p - 9:30p). $15 per person; Free for Deering Estate Foundation Members. Call the Deering Estate Ticket Office at 305-235-1668 ext. 233 to reserve your spot.